Truth, justice and accountability. Bridget Tolley found herself repeating these words several times during Monday night’s 9th annual vigil for victims of police brutality. Tolley spoke behind a banner that read “justice for the victims of police killing” which showed photos of victims of police brutality. As she turned to face the 13 police officers in front of the Fraternité des policiers et policières de Montréal, Tolley voiced her distrust in law enforcement. 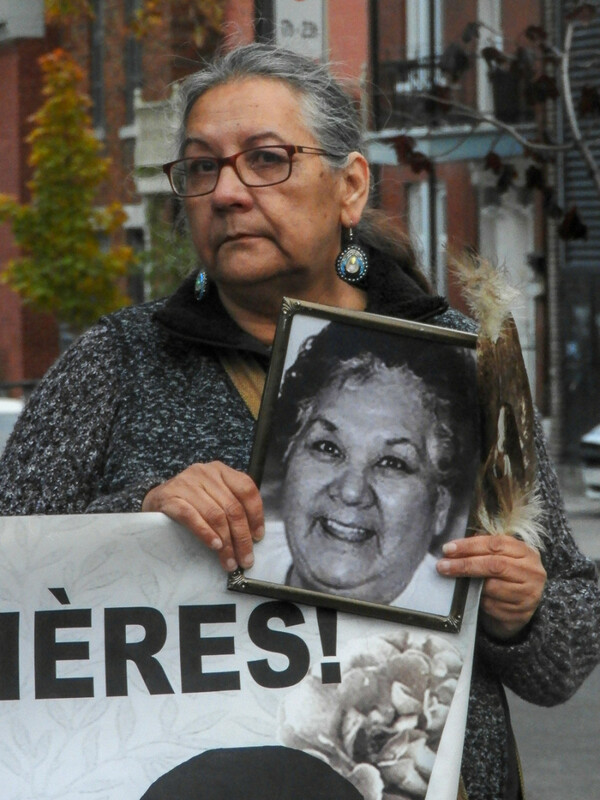 In October 2001, Tolley’s mother, Gladys Tolley, was struck and killed by a Sûreté du Québec police cruiser. Tolley recited the hardships she endured in the 17 years following her mother’s death, and the investigation that followed. According to Tolley, there were three police forces involved in her mother’s death, including the SQ, Service de police de la Ville de Québec and the Kitigàn Zìbì Police. Almost two decades later, Tolley said it’s hard to trust any of them. Tolley said she didn’t know anything about her mother’s case until a year later. She found out after a newspaper reporter called her. “None of the police forces contacted us, told us nothing,” Tolley said. After Tolley received the coroner’s report almost a year later, she noticed several mistakes, including the report stating the family identified the body. According to Tolley, she was never able to see her mother. There’s no accountability, Tolley said. To hold police accountable, she said there needs to be a thorough investigation into police in every province. For Tolley, when she met other families, hearing their stories, she expressed her gratitude for their support. Photos were placed along the Fraternité des policiers et policières de Montréal, as well as candles lit for victims. One sign read “Canada’s shame.” While other speeches were being delivered, a teal banner with yellow and and white writing was held next to the speakers. 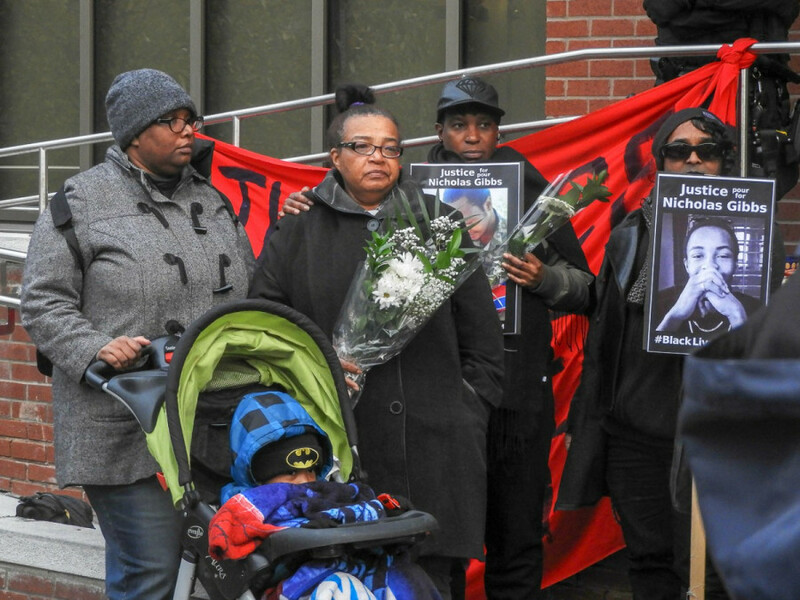 “Justice for Nicholas Gibbs. Another Racist Murder by SPVM,” read the banner. On Aug. 21, Gibbs was shot and killed by Montreal police in Notre-Dame-de-Grâce after allegedly threatening officers with a knife. His nephew, Jeremy Gibbs, remembers waking up in the morning when his friend told him about a shooting. He didn’t know who was shot, but he “had a feeling” something was wrong. Jeremy found out it was his uncle who was shot once he went home. He was hoping it was a lie, until he saw his aunt on the news. 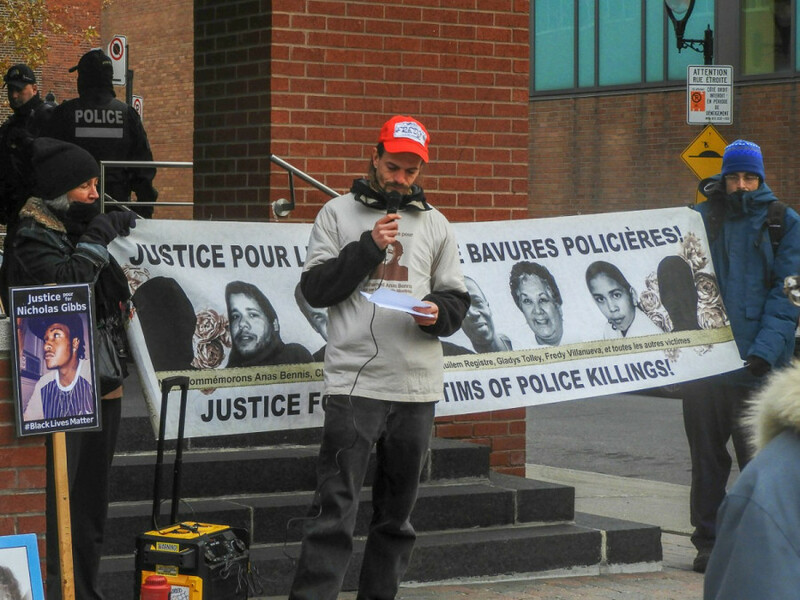 Gibbs continued to voice his own personal experiences with Montreal police to the crowd. He spoke about being profiled, and seeing his uncle’s face slammed on the floor when he was 15 years old while coming home from school. “If we don’t stand up as a people and do something now, this will not just become something that’s rare, it will become something that’s consistent,” he said.